Apocalypse Kow has been working on a lot of things behind the scenes. At our big, annual goal-setting meeting, one of the things we wanted to work on this year was to get more involved with Edmonton’s music community. 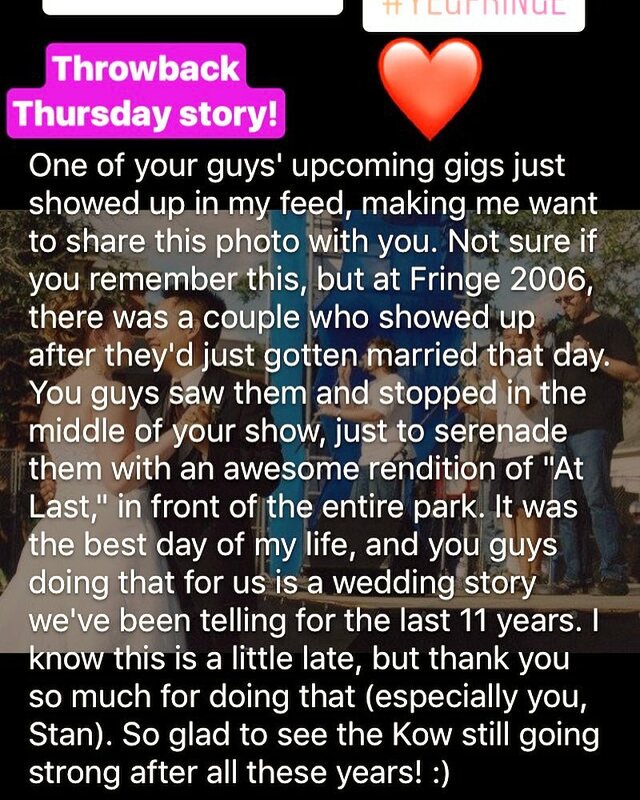 After 18 years of operating in the secret, underground festivals (like the Fringe, Kaleido, and Festival of Trees) and performing at little-known venues (such as the Shaw Conference Centre, Commonwealth Stadium, and the Winspear Centre), we thought it was high time came out from the shadows and do a big show. 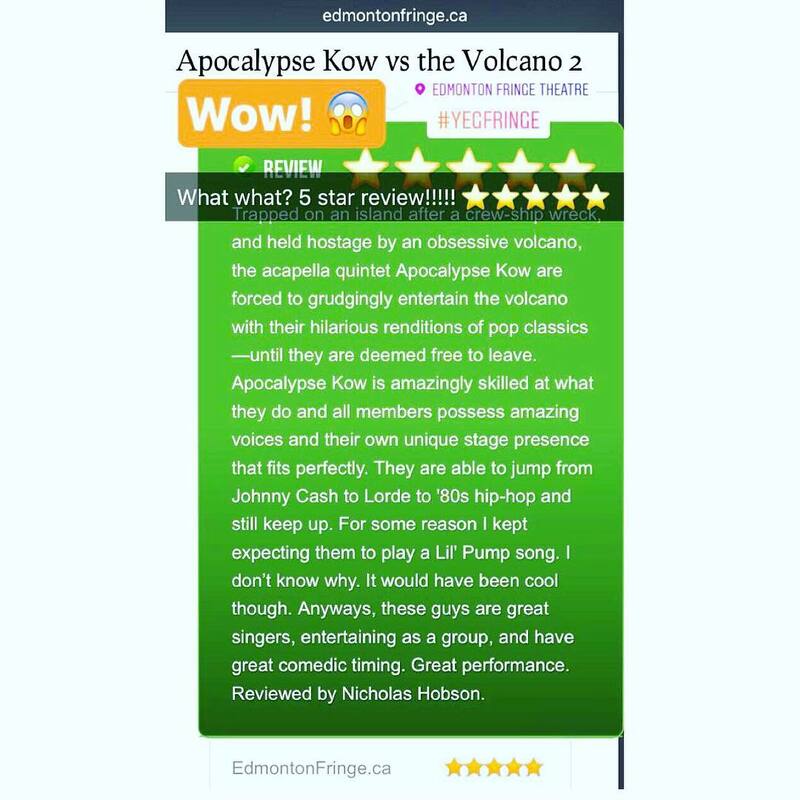 To that end, Apocalypse Kow is hosting the first Edmonton A Cappella Festival (poster at the top of this post). One night, four local groups, all a cappella. Unlike Northern Harmony, an a cappella show which we have also done, this show is a non-competitive one. We want to showcase some of the great a cappella music that is happening in our city that you may not have heard about! The Edmonton A Cappella Festival is happening really soon – April 8th, at the Journey Church of God, doors open at 7pm, show at 7:30pm. Tickets are only $15, but if you’re a student, you can get in for $5. That’s right, only FIVE DOLLARS! So bring your friends, your family, your choir, anyone you think would enjoy a night of a cappella styles. 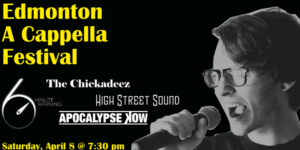 In addition to Apocalypse Kow, you’ll see 6 Minute Warning, The Chickadeez, and High Street Sound. So come out to the first of what we hope to be many evenings of Edmonton a cappella. And bring your piggy bank because groups will have CDs and other merchandise available for sale at the show! If you just can’t wait to buy your ticket, we have an Eventbrite page up for the festival! And you can find us on Facebook, too! We hope that those of you who donated to last year’s Indiegogo campaign are enjoying the super secret bonus track we released. If you have any thoughts about it, please let us know on one of our social media accounts (Twitter, Facebook, or Instagram). We always like to hear what you folks think about the stuff we do. On that note, it is my duty to report that, unfortunately, we still haven’t heard back from the music publishers regarding our use of parody for the Christmas album. Over the next little while, Kow will have to make a decision regarding how to get those tracks out to you, our loyal fans, and to the donors to the crowdfunding campaign. We are not without options. We could make the parody tracks a free download, or as we did with the super secret bonus track, we could release them to our donors first and to the general public later. We would have the non-parody tracks pressed onto a physical CD release, in those cases. Perhaps we would release the Christmas disc in digital format only. We’re still exploring these options, but we wanted to let you guys know that we haven’t forgotten your generous support or our obligation to our fans. The good news is that we are starting to plan our performance season, and holy cow, do we have some plans to hint at! the most important news is that after a year off, Kow will be applying to the Edmonton Fringe Festival again! We’ve already secured a venue, we’ve all but decided on a concept for the show, and we’re planning new merch to coincide with the show! we’ve been having a blast coming up with ideas for it, and longtime Kow fans will recognize the inspiration for the show, which dates back to our early outdoor stage days at the Fringe. But the Fringe isn’t until August. What is Kow up to in the meantime, you may ask? We weren’t content with just one show in the meantime, so we may have two shows to announce in the coming months! *checks calendar* Correction: we may have three performances to announce in the months before Fringe. Do you or your work/organization have an event that Kow would be perfect for? 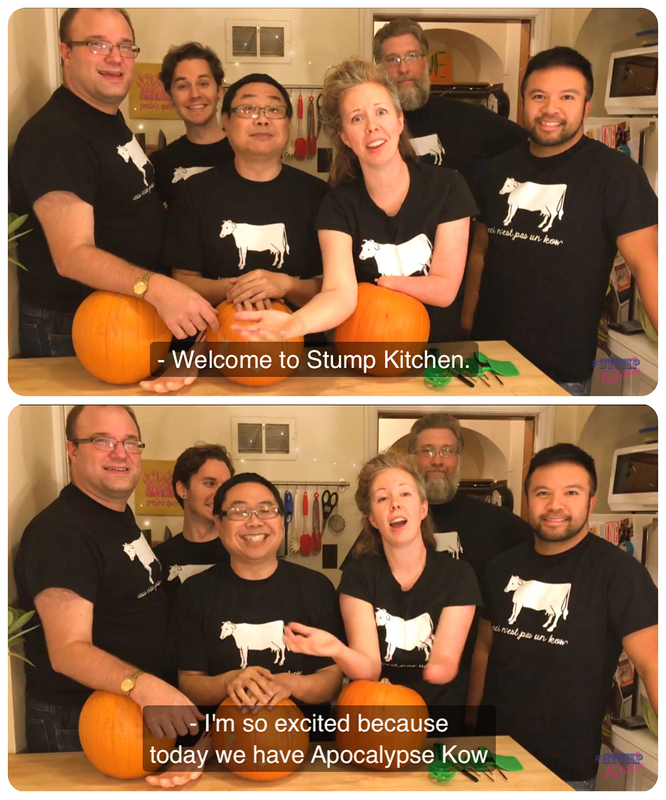 A fundraiser? Party? Wedding? Dinner? Morris dancing competition? We are still available for private functions and events and our rates are reasonable. And hey, February marks the beginning of Kow birthday season. Joel R. had his birthday a couple of weeks ago, Jago has his birthday tomorrow, and Stan and Devin have theirs in March. Joel F. is the outlier with an April birthday. So be sure to wish those Neds a happy birthday and buy them a beverage! We’ll talk to you again once we have more news to share! Thanks, Kow pokes! Happy December, friends and neighbours in Kow Country. We promised to give you an update on the Christmas CD, so here it is. As mentioned previously, the album had been fully recorded and mixed and we were only waiting on the mechanical reproduction rights for the parodies to come through before we could release the disc to manufacturing. Unfortunately, it’s been weeks and we haven’t heard anything from the publishers and rights holders. Yet. We still anticipate the we will be granted permission to publish the parodies on the Christmas album–if you’ve been to a Kristmas Kabaret, you’ve heard them before–but we are currently in a holding pattern. As such, we won’t have the CD ready in time for this Christmas season. We were prepared for this eventuality, but that doesn’t make the disappointment any less real. We are as excited to get this CD into your hands as you are to receive it. We are still planning to release the CD next year when we get the necessary authorizations, and when we do, we will announce it to our fans and our Indiegogo campaign donors. But we don’t wish to leave you all without a Christmas present. If we can’t get you guys the whole CD, we can at least give you a preview. All Indiegogo donors who would have received a CD (or two) will, for the time being, receive access to one of the songs that featured on the CD. We will send you a special URL in the next week or so. This information will be repeated in an upcoming email to CD-level donors. That’s it for the bad news. 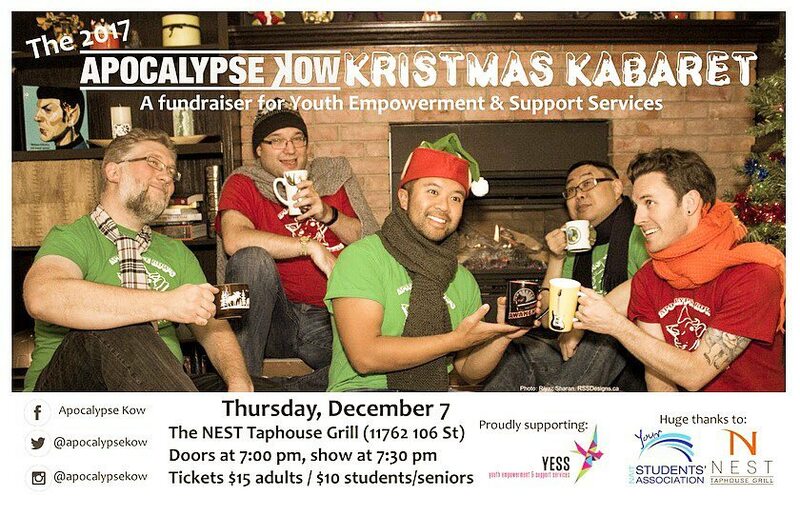 Speaking of Christmas, Indiegogo donors who are entitled to Kow t-shirts, please let us know if you are coming to the Apocalypse Kow Kristmas Kabaret on Thursday, December 8 at The Nest Taphouse Grill at NAIT. We’ll be sure to have your merch waiting for you at the show. Hello, Kow boys and Kow girls and non-binary Kowpokes. Here are a few bits of Apocalypse Kow news to cap off a wonderful, warm week. First, the one you’re probably most interested in hearing about, is the new Christmas CD. There are a couple of developments on this front. Firstly, we decided that, since the number of people who donated to our Indiegogo campaign was manageable, we decided to put every donor’s name in the thank-yous on the new CD! That’s right, even if you donated $7 (as one of you did), you’re getting a thank-you in the CD liner notes, as well as a Christmas card thank-you, assuming you included your address with your donation. Secondly, here’s where we are production-wise. we have completed all of the recording for the Christmas album. We have a completed draft of the disc and packaging. We even have a name: A Very Kow Kristmas. we even have a manufacturer lined up. The only thing we’re waiting on now is authorization from the various music publishers. This is the same thing we’ve had to wait for on all our previous CDs, and depending on how “on the ball” they are, we could receive word in a few days or a few weeks. We’ve also complicated matters a little by having parody songs this time around, which require a slightly different process. None of this changes our plans, however. 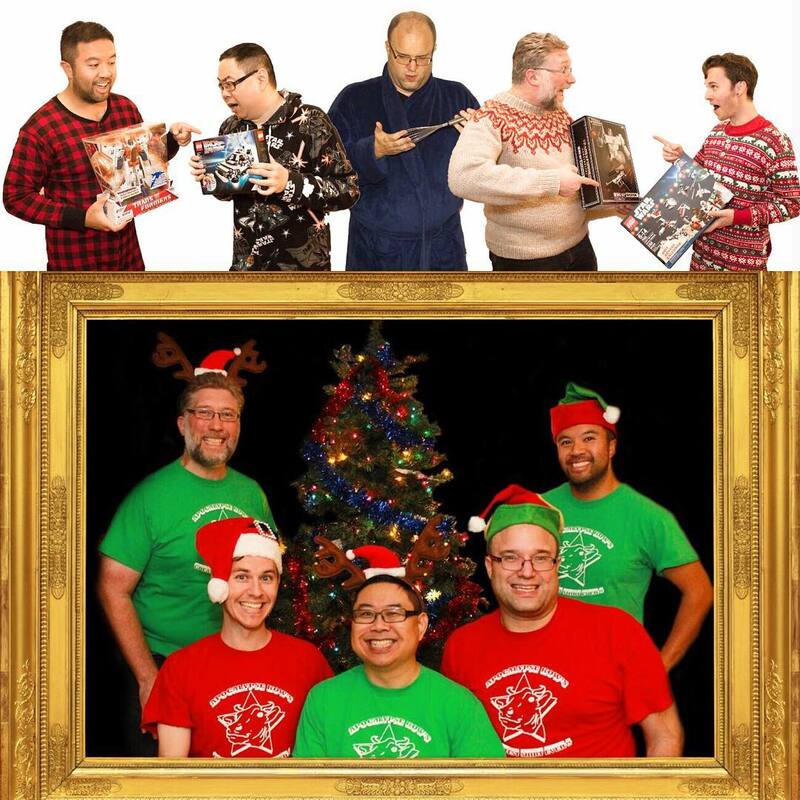 As we stated on the Indiegogo campaign, releasing the Christmas album at the Kabaret was a best case scenario. If we experienced any delays, we knew we would have to delay the release. This has not changed. we are still hoping to release by the Kabaret, but the disc may be delayed. We will keep you all in the loop, not just as fans, but as donors who have helped make this Christmas album a reality for us. Finally, we somehow managed to land a few holiday gigs this year. We have two company Christmas parties in December, and we’ll also be performing at the Festival of Trees! So whoever’s been throwing our name out there, thank you. And thank you, Kow fans. We’ve had a very busy year. You guys help keep us motivated with your smiling faces in the audience, your raucous applause, and your effusive praise. This is our 18th year of singing. 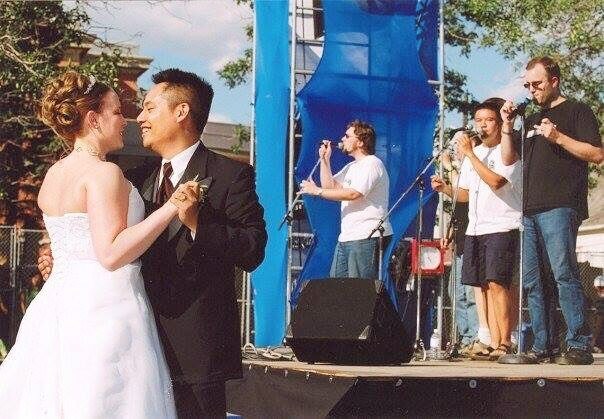 I can’t imagine what our 20th will be like. Edit: included greeting for non-binary-identifying Kow fans. Apologies for the omission. Wow, what an autumn it’s been for Apocalypse Kow this year. 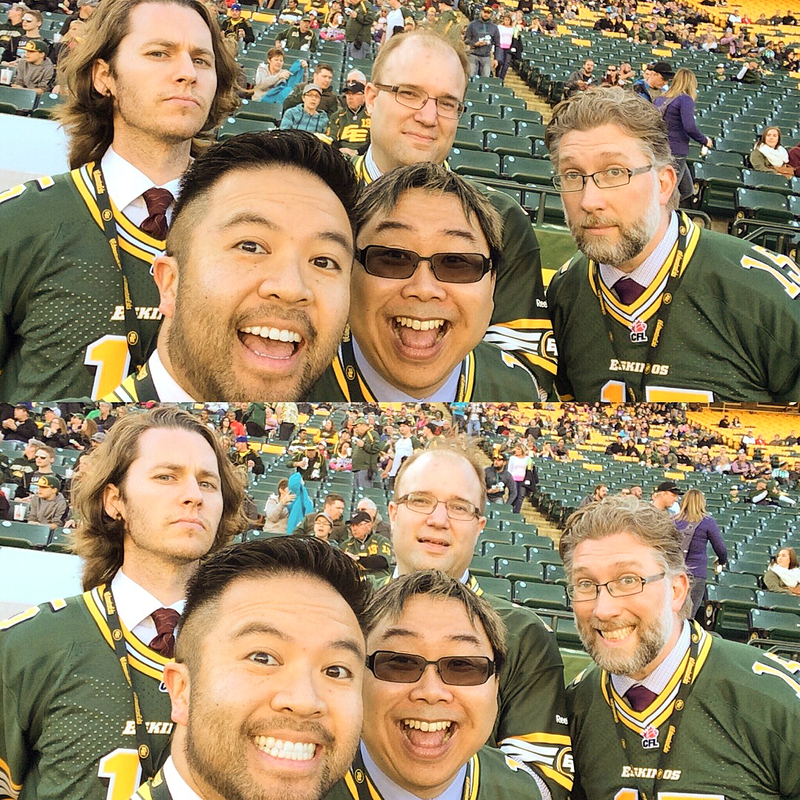 As if it weren’t awesome enough that we got to sing O Canada at the Edmonton Eskimos game, we also got to walk in the footsteps of Edmonton history by singing O Canada and The Star-Spangled Banner at an Edmonton Oil Kings game! That’s right, friends. In case you haven’t been tuned into our social media, we got to walk out onto the ice at the historical Northlands Coliseum and start off a hockey game. Both organizations treated us extremely well, ad we’re hoping that we’ll be called upon again. And again. And again! It’s such a privilege and an honour to sing our national anthem at a sports event. But we’re not through with 2015 yet. Our next appearance is this Saturday. Yes, we will be performaing as part of the All is Bright Festival on 124th street. We were asked by our friends at local comics store Variant Edition to perform at one of the post-Festival celebrations that are happening all around 124 street after the main Festival ends at 8pm. We’ll be doing a lot of old favourites and more recent hits, and a handful of holiday/winter/Christmas songs. And the best part? The show is pay-what-you-can! We will also be selling CDs at the show, which make for fantastic Christmas gifts for friends and family both local and distant. And Kow-zoos for the kids… or your friends’ kids! If you’re checking out the All is Bright Festival, stick around afterwards and head to Variant Edition at 8pm for an Apocalypse Kow fun-time performance! The info is posted to our Facebook page now! Notes: A pay-what-you-can performance as part of the All is Bright on 124 street festivities! Singing a mix of classic hits, more recent favourites, and a handful of holiday tunes!